We conduct world-class research in the atmospheric mercury cycle. A cornerstone of our work is a state-of-the-art modeling system that tracks mercury emission sources and links these emissions to atmospheric transport, transformation, and deposition. We also conduct long-term intensive monitoring of mercury in ambient air. Data collected are analyzed to gain useful insights into the origin, transport, and deposition of atmospheric mercury and for interpreting and evaluating our mercury modeling system. Our mercury products and services directly support air quality decision-makers, air quality forecasters, and the mercury research community. A graphical display of the mercury cycle. The majority of mercury released to the environment is into the atmosphere. Mercury emissions come from a variety of sources and may be emitted in several forms. Mercury eventually deposits to watersheds and receiving waters where it can be converted to methylmercury, a highly toxic form. There mercury can enter the aquatic food chain through bioaccumulation. Human exposure to mercury is primarily from consuming contaminated fish. Methylmercury can adversely affect the nervous system, particularly those of fetuses and young children. 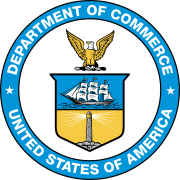 As a result, fish consumption advisories due to mercury contamination are widespread throughout the United States. 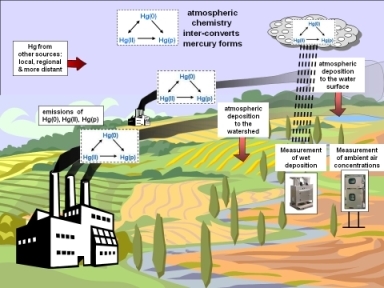 Understanding where mercury emissions originate from; how and where mercury is transported and deposited; and what changes will occur due to emission controls is critical information for policy-makers and regulators.